Yesterday I watched Snape Kills Dumbledore: The Movie, the newest movie rendition of J.K.’s much-loved and -abused series. It’s unfortunately shallow and not fun to watch, as much of the original plot is bulldozed to make way for the WB executives’ idea of the books. Many things that did not happen in the book were shoehorned in (The Burrow catching fire, romantic relationships developing early, Harry like trains) and things that did, didn’t. Watching the movie of a book also spoils the images that you have of the characters. Granted, there’s not much difference between what you imagined Harry to look like and Daniel Radcliffe, but Dumbledore was younger for me and Hagrid was bald. The movie’s carefully market-balanced character appearances ruin the fun of creating them in your head. I had no desire to see this movie, and would not have if the tickets weren’t purchased before I let the purchaser know that I didn’t want to go. It’s killed part of my childhood by another one-seventh and I will refuse to let go of the last bit unless someone threatens me with the Elder Wand. 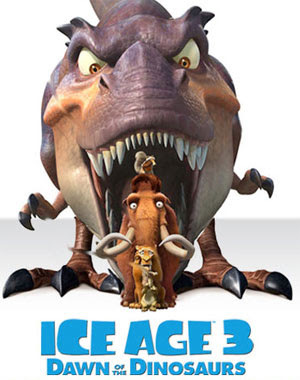 Stared at a screen for 1-2 hours today while Ice Age 3 played on it. The entire thing comes off as stale, marketing-centered and underdeveloped. The main idea is that our intrepid heroes (A brainless sloth, an aging saber-tooth tiger, a pregnant mammoth and her over-protective mate plus two perpetually-high rodent things) discover a tropical world underneath the perma-frost populated by DINOSAURS. Yes, dinosaurs. In a period when every one of them died out when a great big rock hit the earth millions of years ago, there are dinosaurs underneath the earth. After searching for their lost friend, they come across an insane one-eyed weasel, who is a better character than many of the others. He helps them rescue their friend, then is enlightened about the value of friendship, love and family. He deliberates about whether to join the others on the surface above, but declines and goes back to the jungle to fight an albino T-rex. Does anyone think about what they are creating? Why did this plot come to the screen? Someone needs to think harder before approving scripts. Saw the movie today, I can’t say it’s a good one. It includes some plot from the official Origins comic and continues on from it. There’s some cool mutants/highly-trained humans in the movie, but the main star is Wolverine, and how he was inducted into the Weapon X project and became the icon he is today. Some references to current X-Men lore were made with a young Scott Summers (Cyclops) and Professor X making an appearance. It’s disappointing that Wolverine was the huge star as he eclipsed some of the groovier superpowers. There were people with diamond- encrusted skin, teleportation and Gambit’s thing where he charges objects with energy and makes them explode. The ending and how Wolverine loses his memory is a little too neat, with the invention of Adamantium bullets being used to fill in the holes. Just finished watching the movie Equilibrium, a sci-fi gun-fu movie about a futuristic society where human emotion is suppressed and art, music and other emotional objects are hunted down and destroyed. The protagonist is a Grammaton Cleric, a branch of the law responsible for hunting down and killing anyone who experiences an emotion. They practice a martial art called Gun Kata, where probability and geometry place the shooter where they are most likely to hit their targets and not get shot. The system of invasive observation, psychological indoctrination and aggressive apprehension of criminals reminds you of Nazi Germany; most especially where a small child directs armed guards to grab people from a moving crowd on the sidewalk and take them for questioning. The gunfights are stunning, with gadgets sprouting from guns and sleeves to further killing efficiency. Many are up close, especially in the last and climatic battle with the villain and hero shooting from point-blank range whilst trying to stop the other. The portrayal of emotion suppression was well acted, with not a hint of a smile or frown upon the actor’s faces during the right times and subtle expressions at others. Saw the Coraline movie trailer today, looks awsome. I have read the graphic novel by Neil Gaiman that this movie is based on and it sounds like a plausible idea. Apparently the stop-motion figurines used in the movie are created using a process called 3D printing. A computerised sprayer puts very fine layers of latex onto a rough model that are then each time set hard with a laser, creating a very subtle and well-made expressions and surfaces for the characters. Another movie Gaiman has had a hand in is MirriorMask, a surralistic movie about a young girl’s adventure into a paper world.